This activity is structured to have your students be truly interdependent as they work together in their groups. 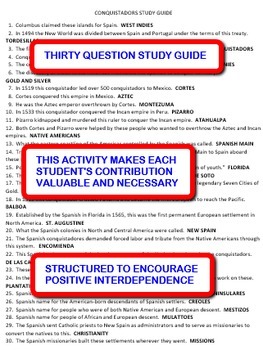 Included is a thirty question STUDY GUIDE that they will go over together for about ten minutes prior to starting the lesson. Each group will then get five ANSWER SHEETS. No two ANSWER SHEETS are exactly alike. Each ANSWER SHEET has eighteen of the thirty STUDY GUIDE questions on it. That means every STUDY GUIDE question is on three of the five sheets in the group. Every member of the group will also get one of five different ANSWER SLIPS. Each slip has six of the thirty answers to the STUDY GUIDE questions on it. Every ANSWER SLIP has six separate answers on it. No answer is repeated on any slip. You will have your students answer the questions in the space provided on the ANSWER SHEET. In addition to writing the answer, the students will also have to write the number of that answer as it appears on one of the ANSWER SLIPS. This means that they will have to ask the other members of the group for the numbers to those answers. 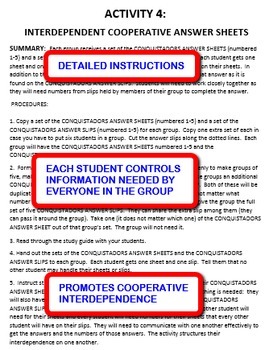 Every student in the group will have answers and numbers needed by every other group member to complete their sheets. The students will have to talk to one another to be successful! Every student will have to participate to achieve group success. 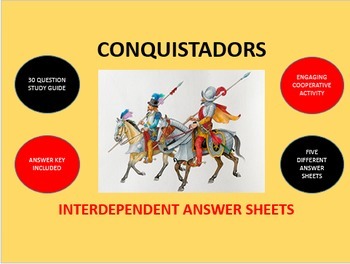 Both the STUDY GUIDE and the ANSWER SHEETS activity are part of a ten activity packet which includes five cooperative group activities and five engaging games covering Conquistadors-Spanish Conquest in the Americas.